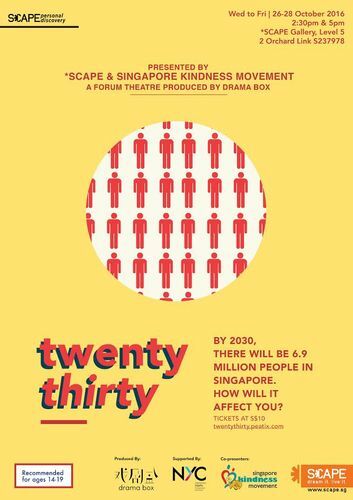 Twentythirty, a forum theatre production co-presented by the Singapore Kindness Movement (SKM) and *SCAPE, seeks to address the subject of integration between Singaporean and non-Singaporean students. This is the first time SKM and *SCAPE are collaborating for youth programs. Twentythirty will take the audience on an interactive journey as the show incorporates theatrical performance and engagement, inviting the audience to imagine the society they want to create through the play. Through a facilitated segment, the audience will be encouraged to question and discover for themselves the role that they can play in accepting differences and embracing diversity. Produced by multi-award winning theatre company Drama Box and supported by the National Youth Council, the show will be held from 26 to 28 October 2016 at the *SCAPE Gallery. Tickets are available for online purchase from now till 28 October 2016. Limited to 74 seats per show. While stocks last!